If you are self-conscious about the shade of your teeth why not consider professionally tooth whitening? The tooth whitening process is activated by a bleaching agent, which is inserted into the custom tray that fit over your teeth and are worn for 4-6 hours or overnight for 2-3 weeks. Why not keep your bleaching trays and you can buy 'top up syringes' of the whitening solution from our reception staff should you wish to repeat the procedure for an upcoming party, wedding or other event. Please consult our 'Frequently Asked Questions' sections for further information. The dentist will take impressions of your teeth to allow a model to be made by the lab. This is then adapted and a used to produce a specially made tray which fits into the mouth like a gum shield. Your dentist will then advise on the procedure of tooth whitening and provide you with adequate whitening solution, and you will be required to complete the procedure at home. This will involve you applying a small amount of 'bleaching solution' (the active ingredient in which is 16% carbamide peroxide), into the front 'wells' of your bleaching trays. 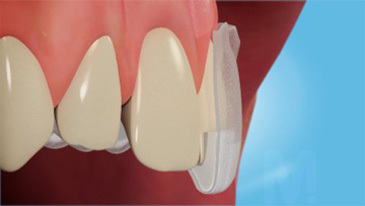 The tray is then fitted into the mouth and any excess solution wiped away with a clean dry tissue. The trays should be worn for 4-6hours or overnight for a period of 2-3weeks until a satisfactory shade is achieved. It is advisable to avoid products which may stain your teeth (e.g. tea, coffee, red wine, curry) for 1-2hours prior to and after the procedure. Many patients suffer a slight sensitivity during tooth whitening, which is usually minimal and temporary. Brushing your teeth with a sensitive toothpaste is advisable during the time you are completing the procedure to minimise this. In cases where sensitivity is slightly more uncomfortable, placing a sensitive toothpaste within the trays and wearing these for a couple of night will significantly improve matters. In teeth that have been root treated and darkened – it may be necessary to re-open the tooth and place the whitening products inside. Whitening results on such teeth can be more unreliable, and in many cases the tooth may not lighten significantly. Everyone is different; and just as our hair and skin colour varies, so do our teeth. Some teeth have a yellowish tinge, some are more beige – very few are actually 'white'. Teeth also yellow with age and become stained on the surface by food and drinks such as tea, coffee and blackcurrant. Calculus (tartar) can also affect the colour of the teeth. Some people may have staining inside their teeth; this can be caused by certain antibiotics or tiny cracks in the teeth, which take up the stain. Your dentist will advise you if staining is present on the tooth surface and discuss options to remove this. This may be with a simple scale and polish, however our private prophyjet cleaning is excellent for removing this staining and enhancing the results of the tooth whitening (please ask for further information). Treatment results may vary depending on the original shade of the teeth. The effects of tooth whitening are not permanent and will relapse over time. To maintain your whiter teeth you will need to 'top up' the effects – usually 1-2 syringes of whitening solution or 2-4 'top up sessions' per year. Keep your bleaching trays and you can buy 'top up syringes' of the whitening solution from our reception staff should you wish to repeat the procedure for an upcoming party, wedding or other event. Over-the-counter kits are not recommended as they contain only a small amount of hydrogen peroxide which makes the product less effective. Some also contain mild acids, while others are abrasive. Although these products are cheaper, whitening is a complicated treatment procedure and should only be carried out by a dentist after a thorough examination and assessment of your teeth. Guidelines released by the General Dental Council in Oct 2012 advise that only dental professionals can carry out tooth whitening and enforce the EU Directive on the strength of bleach that can be used. Many non-dental professional and over-the-counter kits use inadequate products which may not whiten the teeth and even worse can irreversibly damage the tooth tissue. Whitening can only lighten your existing tooth colour. For a change to specific chosen shade veneering is another option. Whitening also works on natural teeth; it will not work on any type of 'false' teeth. This includes dentures, crowns, veneers and white fillings. Stained veneers, crowns, white fillings dentures may need replacing to remove the stain or the match teeth which have been whitened. In rare cases, tooth whitening may not work at all. There are now several whitening toothpastes you can buy. Although they do not affect the natural colour of the tooth, they are effective at removing staining and therefore improving the overall appearance of the tooth. These toothpastes are however, highly abrasive and can wear the outer surface of the teeth at a higher rate compared to standard fluoride toothpastes.